As explained in a prior post, a regular feature here is to showcase what the various hotel groups offer and emphasize in terms of fitness, such as health facilities, gyms, pools and menu selections. A recent post focused on the Hyatt Hotels. This post concerns Westin Hotels, part of the Starwood Hotel Group. Directly on the Westin website is a link for the Westin Workout. The page details what the hotel offers as well as its perspective on fitness facilities for its guests. To stay fit and focused while you’re away, you need a workout routine that’s challenging, flexible and rewarding. WestinWORKOUT® combines state-of-the-art equipment and high-performance workouts to create a customized solution for guests who are committed to maintaining an active lifestyle during their travels. The sleek, airy surroundings of WestinWORKOUT Fitness Centers feature the finest exercise equipment from Life Fitness®, Precor® and other world-class brands for all levels of performance. Elevate your energy level on the treadmill and spinning cycle, or grab a mat and let go of stress with Pilates or yoga. 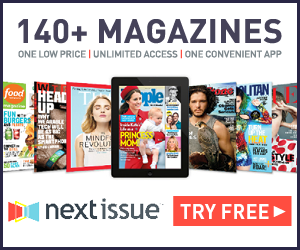 WestinWORKOUT provides all the equipment you’ll need for a satisfying workout, from dumbbells to fitness magazines, headphones, local area maps, complimentary water and more. A satisfying workout provides the energy and focus you need to excel throughout the day. If you prefer to combine your workout routine with fresh air and local scenery, lace up for a group run with our RunWESTINTM* program. We’ve teamed up with New Balance to provide three- and five-mile routes through the city, along the beach or into rural landscapes. Our Run Concierge will share interesting facts about the area as you get energized for the day ahead…or shake off the stress of the day. Runners of all levels are welcome to join the group, or grab a trail map and take off on your own. For those who prefer to work out in privacy or at their own convenience, Westin offers the special option of booking a guest room equipped with a treadmill, a stationary bike, dumbbells, fitness DVDs, resistance bands and stability balls. Exercise at any hour of the day, for as long as you like. We’ll make sure you have bottled water, plenty of towels and whatever else you need for a fulfilling workout. Finally, the website offers a link to running maps at many of its hotels. 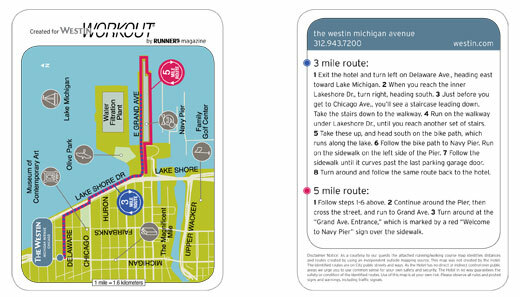 Here is a sample running map for the Michigan Avenue, Chicago Westin Hotel. These maps can be downloaded directly onto a smartphone, or presumably printed on a printer. I like the idea of downloading a map, (and its useful even if you are not actually staying at the Westin Hotel but are visiting the area), but I also am keen on being given an actual map to hold and fold and refold and refold and refold….. well you get the picture. I would guess that the individual hotels have actual maps to hand out as well , but as of now, do not know whether such maps are actually given out. Of course, one cannot judge fitness facilities by a website alone. I was at the Westin at SFO Airport last year for a family event. Although I did use the gym, I honestly was so busy with family matters that I could not fairly critique its fitness facilities. I can say, however, that the hotel itself was lovely in every respect. Actual visits will clarify the size and state of the various facilities. However, given the excellent reputation of the Starwood hotels, and especially the Westin group, it is a positive sign that fitness matters are accorded such importance that they are featured right on the hotels’ website. Westin also rents workout clothes for $5 a day (if you get billed). I’ll admit, I just had to try them and I was impressed by the lack of ick factor. The socks and 3/4 length pants were brand new and the shoes were virtually unused and had brand new insoles. Since lugging workout clothes with me is a huge obstacle to working out on the road, I’m kind of excited about this.